I would like to give a big thank you to guruswizard.com for allowing me to guest post on this amazing site. I quickly became a fan after finding the site recently and reading the article on how to install KiK on my desktop. This is a battle of the fittest and can be an extremely dangerous topic to talk about out in the open, but someone needs to take the gloves off and do it. This is not saying Android is an overall better operating system or is far superior in any form. 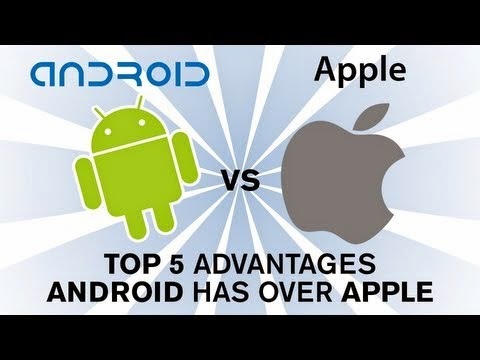 I will be talking about the advantages you can have by using the Android operating system and the little things you can do with it compared to iOS. This is more of a family feature and to be honest as simple as it is its genius. Every family member can have their own account and set it up exactly the way they would like, such as wallpapers, applications, themes, and age restrictions. The accounts can be locked with passwords for added privacy and can lock out users from your own personal world. If you are a big music fan like I am, you will want to transfer everything that you have collected over the years from different locations. When using iOS systems you will be required to use the iTunes feature to transfer over any past music, and if you never owned iTunes, you will have a problem. Android gets the prize by allowing the user to drag and drop music from anywhere into a folder for use. Other media, like pictures, can easily be dragged and dropped into the HDD of the phone or tablet on an Android operating system as well, while having to use only iPhoto on iOS. If you are a gamer you will appreciate the large amount of free applications you can choose from. The Google Play Store doesn’t always deliver the amount of quality certain users demand compared to the Apple Store but it sure has a diverse selection. Indie developers are always free to post their creations in the Google Play Store as well. Sharing talent should be made simple and that’s something you have to give to Android. With the rise of social media, people can’t wait to let their friends know about every action. The Android operating system allows for sharing of all kinds such as Twitter, Flikr, Facebook, and Google+, just to name a few. IOS has fewer and more basic options available, and will possibly increase in the future, but for now the Android is the far superior choice for sharing. After connecting the Android device to your computer you will have access to a file system similar to the Windows desktop and allows for easy access to media, data, and notes. The iOS fails to allow such access with a simple connection. Sometimes keeping things basic for all level of users can be an advantage and Android hits the nail on the head with this feature. Applications can be an important part of everyone’s life in modern society, that being said you always need to be protected and safe from any type of violations. When traveling or connecting to unsecured Wi-Fi networks found in cafes, local library’s, and even hotels, you should encrypt your information so other users cannot gain access to your private information. It is highly recommended by the mobile community to use a virtual private network to scramble your information before you connect, which will block malicious invasions. I really hope you enjoyed reading about the Androids advantages and become an Android user yourself. The possibilities are endless with Android and it easy to master its power.